Plans for a controversial waste to energy plant in Westbury have been thrown out by Wiltshire Council despite it being recommended for approval. Hills Waste Solutions wants to build the plant, which would heat processed household waste to create energy. 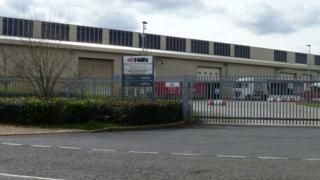 Councillors opposed the plans due to the plant's impact on its surroundings at Northacre Industrial Estate. If the firm challenges the vote, the plans will be referred to the government for a final decision. Campaigner Maggie Danniell, who was against the plans, described it as "a very good result". The proposals were also opposed by Westbury Town Council, which said: "It is the wrong place at the wrong time for this plant, and the people of Westbury oppose it." Andrew Murrison, Conservative MP for South West Wiltshire, said doubts about risks to health from such a plant meant it "should be located as far from human habitation as possible, not right on top of it". Hills Waste Solutions has been approached for comment.